We headed to Burnaby on Saturday, July 23, to spend a couple days with my friend, Leanne, her husband, Sam, and daughter, Marron. We stayed at the Best Western in Coquitlam. We used airmiles and ended up with a two bedroom suite. Very nice! It was nice to see Leanne, Sam and Marron as it had been a while since I've seen and hung out with them. We went to a Greek restaurant for supper that night. Very yummy! Then we took a walk around Burnaby Mountain (where Leanne and Sam got married) - great views. After they dropped us off at our hotel, we found a pub nearby called the Foggy Dew and we had a couple pints on the patio. Sunday, Leanne, Marron, Leanne's mom, Shirley, Gord and I went to Storeum in downtown Vancouver. It's a "theatrical presentation" of British Columbia's history. It was very entertaining. That afternoon, Leanne, Sam, Marron, Gord and I went to Capilano Suspension Bridge. It's a swaying 450 foot bridge that crosses above Capilano Canyon. Once there, we (Marron, Gord and I) did the Treetop Adventure - suspension bridges from tree to tree. Then it was supper at White Spot. Monday, Gord and I drove to Whistler. 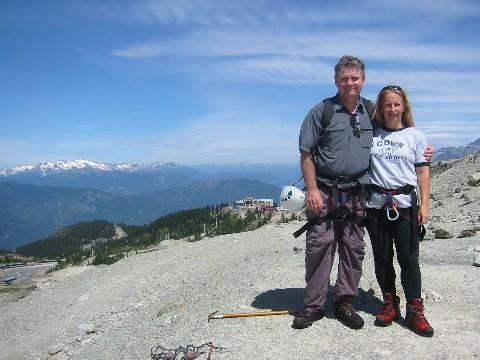 We stayed at the Whistler Pinnacle. We had a nice room with a full kitchen, balcony and a big jacuzzi. We loved Whistler! It's such a cute town. We spent the afternoon walking around the Village. 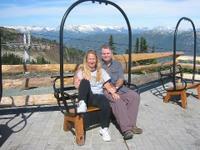 Tuesday (our third anniversary), we took the gondola up Whistler Mountain and went glacier hiking. Neither of us knew what to expect - but it blew us away. We hiked to Whistler Glacier and then got our gear on - helmet, crampons, harness, rope, etc. And off we went climbing up 500 feet over snow and blue ice. Wow! Our guide, Monica, was great! We were surprised at how warm it was - probably about 20C. Then we came back down - it took a lot less time. We had lunch at the Roundhouse - we were starving!! Then we took another gondola to the Peak - what a view! We headed back down to the Village and had a couple drinks at Black's Pub. We were exhausted so it was an early night. Wednesday, we took the gondolas to the top of Blackcomb Mountain (it takes three gondolas and a bus to get to the top). There were people skiing and snowboarding. The air was so fresh and cool - about 12C. We had a beer at the restaurant patio. Best place we ever had a beer, surrounded by mountains. We had supper at Milestones that night (across the street from our hotel) and then went to a pub called the Dubh Blinn and sat on the patio listening to Guitar Doug. We headed back to Vancouver on Thursday. We went to Granville Island that afternoon - it was very close to our hotel. There is a microbrewery there and we'd gotten to like that beer (Granville Island Brewery). Then we headed for Robson Street. Natalie, our waitress at Black's Pub in Whistler, said the Cactus Club makes the best Bellini's so we had to check 'em out. They are better than Milestones'. Then we went to Cloud Nine, a revolving restaurant. It takes 80 minutes to make the revolution and you get a great view of Vancouver. We ended up in Gastown for supper. Along the way back to our hotel, we came across a pub called Doolin's. There was a Celtic band playing called the Halifax Wharfrats so we stopped for a while. Friday, we walked to Stanley Park by way of English Bay. We walked around the park (9 km). We walked to Yaletown on our way back to the hotel and came across a microbrewery. We sat on their patio for a while. Onwards again we stumbled upon a Brazilian street festival. Free food and booze so we stopped in. Later that night we went to a bar called the Two Parrots on Granville Street for a late supper. There was a jukebox and there was quite the selection of tunes being played by the customers. 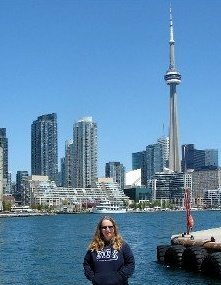 Saturday, we went for a 75 minute cruise around the harbour. Then we walked up to Yaletown and had a late lunch at Dix - huge meal of ribs and chicken. Way too much food. We sat on the rooftop patio of our hotel for a while before heading out to the casino. I won playing roulette (my first time playing) - I started with $20 and left with $120. Sunday, we flew home. Just before we landed in Toronto, the pilot turned off the lights of the plane so we would watch a lightening show happening below us. Happy anniversary to Gord and me!